You’ve read the introduction books, you’ve keyed in the hello world examples, now it’s time to dive deep into solutions from experienced developers working in interesting domains. Like many of you I’m sure I’ve collected a bookcase full of books introducing an array of languages and technologies. But like you I crave material that is based on actual experience of developing real-world systems in interesting domains. The excellent Beautiful Architecture and Beautiful Code books present chapters from experienced developers who talk about real-world applications they’ve worked on. 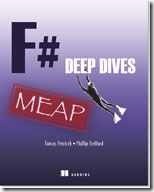 F# Deep Dives goes deep on simple functional solutions with F# applied to interesting domains like finance, machine learning and games. F# is a practical, functional-first language that lets you write simple code to solve complex problems. By focusing on F# we have been able to draw from a wealth of experienced developers working on practical problems in interesting domains. F# is also a very expressive language which means that each chapter can focus on showing solutions without having to sacrifice content because of excessive amounts of boilerplate. The solutions should be easy to follow for developers with or without F# experience and interesting whether you intend to solve problems with F# or another functional-first language like Scala or Clojure.